An optical switch developed at the Joint Quantum Institute (JQI) spurs the prospective integration of photonics and electronics. The JQI switch can steer a beam of light from one direction to another in only 120 ps using only about 90 attojoules of input power. At the wavelength used, in the near infrared (921 nm), this amounts to about 140 photons. In the PFC-supported experiment, an all-optical switch has been created using a quantum dot placed inside a resonant cavity, within a photonic crystal. 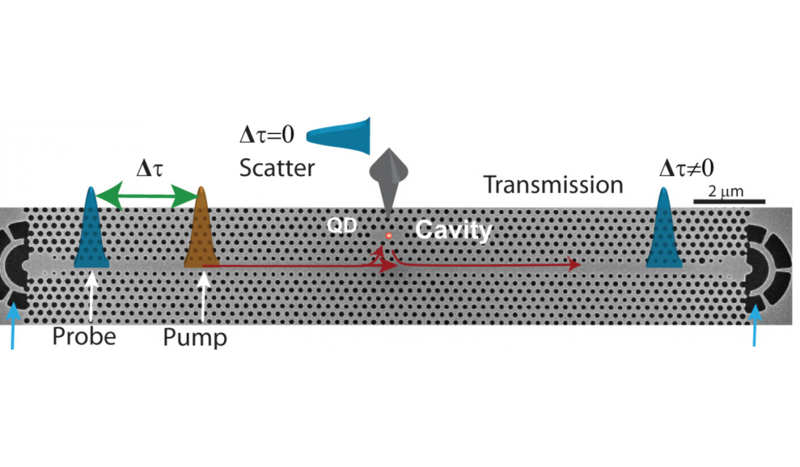 When light travels down the nearby waveguide some of it makes its way into the cavity, where it interacts with the quantum dot. It is this interaction which transforms the waveguide’s transmission properties. Previous optical switches have been able to work only by using bulky nonlinear-crystals and high input power. The switch, by contrast, achieves high-nonlinear interactions using a single quantum dot and very low power input. Switching required only 90 aJ of power, some five times less than the best previous reported all-optical switch, albeit at a temperature of around 40 K. JQI researcher Ranojoy Bose says he expects an improvement (reduction) in the number of photons needed to switch the resonant cavity on and off. In the meantime, the switch represents a great start toward creating a usable ultrafast, low-energy on-chip signal router. The paper shows that switching can be achieved physically by using only 6 photons of energy, which is completely unprecedented. This is the achievement of fundamental physical milestones—sub-100-aJ switching and switching near the single photon level.